Outfire Browser is the PUP that uses misleading techniques to prevent removal. Use Reimage to locate malicious components and get rid of them faster than with uninstall instructions. A full system scan blocks virus reappearance and prevents traffic to malicious domains. Why should you keep your computer free of Outfire Browser virus? How to protect your computer from Outfire Browser hijack? Typically, Outfire Browser virus gets inside victim’s computer with the help of Mutabaha Trojan. 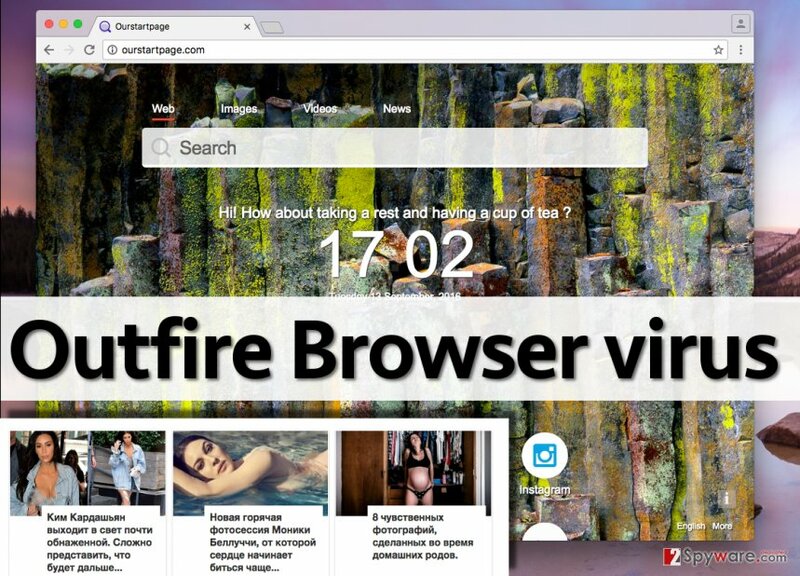 Outfire Browser is Chromium-based and hardly differs from the real and legitimate browser. Well, of course, only from the first sight. In reality, it is a highly dangerous computer parasite designed to display advertisements on user’s screen and integrate them into websites that he or she enters. Outfire Browser hijack happens when the previously mentioned Trojan installs a malware dropper on the compromised computer system and a Windows Batch (BAT) file. Once the malware dropper installs the bogus web browser, the BAT file removes the malware dropper from the system, concealing signs of its existence. Outfire Browser adware assigns itself to Startup programs and launches on Windows startup. It removes real Google Chrome shortcuts from user’s desktop and start menu, replacing them with its own ones. Of course, these shortcuts are designed to pose as real Chrome shortcuts, but of course, they are not. The first sign indicating that your system has been hijacked by this potentially unwanted program (PUP) is OurStartPage.com homepage, which appears on the fake Chrome browser’s startup. If this web page featuring a search engine shows up in your browser, do not ignore this signs and scan your computer system using Reimage or similar software to detect and remove Outfire Browser malware. As we have mentioned, this fake browser incorporates web ads, which, needless to say, can be dangerous. Clicking on them might open untrustworthy Internet sites filled with questionable content. It goes without saying that Outfire Browser ads are no regular ads and that they cannot be trusted. Be aware of the truth that this fake web browser tracks your activity online while you use it, including your search queries, downloads, browsing history, and similar information, which helps it to select targeted advertisements for you. Beware of these catchy-looking ads, or they might transfer you to potentially dangerous places on the Internet. That is why we suggest you to complete Outfire Browser removal without a doubt. We have already mentioned that Outfire Browser hijack occurs due to Mutabaha Trojan. Beware of this malicious infection because it is capable of installing even more malware on your system! This Trojan might slither into the system after carelessly installing untrustworthy programs or after downloading bogus software updates (which are actively advertised via various shady third-party sites). Remember – install only trustworthy programs and updates, which can be found on verified and secure websites. It would be the best to install software only from websites that belong to official software developers. Please, do not be tempted by free downloads presented on shady websites – such downloads are frequently bundled with untrustworthy or even dangerous files. If you have already installed this adware on the system and don’t know how to uninstall it, then continue reading the information provided below. PC. However, we still provide manual removal instructions that might help you to remove this fake Internet browser. Please complete the removal procedure automatically if you cannot delete it manually. Here, look for Outfire Browser or any other recently installed suspicious programs. Wait until you see Applications folder and look for Outfire Browser or any other suspicious programs on it. Now right click on every of such entries and select Move to Trash. When in the new window, check Delete personal settings and select Reset again to complete Outfire Browser removal. Once these steps are finished, Outfire Browser should be removed from your Microsoft Edge browser. Here, select Outfire Browser and other questionable plugins. Click Remove to delete these entries. Now you will see Reset Firefox to its default state message with Reset Firefox button. Click this button for several times and complete Outfire Browser removal. Here, select Outfire Browser and other malicious plugins and select trash icon to delete these entries. Click Reset to confirm this action and complete Outfire Browser removal. Here, select Extensions and look for Outfire Browser or other suspicious entries. Click on the Uninstall button to get rid each of them. Now you will see a detailed dialog window filled with reset options. All of those options are usually checked, but you can specify which of them you want to reset. Click the Reset button to complete Outfire Browser removal process. This entry was posted on 2016-09-13 at 07:11 and is filed under Adware, Viruses. You can quickly scan the QR code with your mobile device and have Outfire Browser ads manual removal instructions right in your pocket. How did you remove Outfire Browser ads?